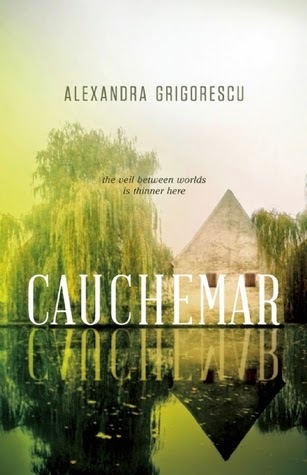 Today, I'm happy to the next stop on the Cauchemar blog tour, to celebrate Alexandra Grigoresu's debut release, Cauchemar from ECW Press! Add Cauchemar to your Goodreads lists here. Gripping, fast-paced, gorgeously written, and with unforgettable characters, Cauchemar tells the story of 20-year-old Hannah, who finds herself living alone on the edge of a Louisianan swamp after her adopted mother and protector dies. Hannah falls in love with Callum, an easy-going boat captain and part-time musician, but after her mysterious birth mother, outcast as a witch and rumoured to commune with the dead, comes back into Hannah’s life, she must confront what she’s been hiding from — the deadly spirits that haunt the swamp, the dark secrets of her past, and the nascent gift she possesses. Like the nightmares that plague Hannah, Cauchemar lingers and haunts. A dark gripping debut from a very talented writer! Cauchemar included many of my beloved elements of what I consider to be a great new adult read- believable love story and romance, strong likeable heroine and hero, but this story is so much more than just a romance, it's about a young woman, Hannah, entering adulthood and learning how to cope with who she is and where she belongs. Grigorescu does a marvellous job of describing the dark gothic scenery of swamp-land in the deep South. While the love affair, between these two, took off quite quick and they were thrown MANY curveballs, I enjoyed to pace of this romance, and still found it quite believable. I have been on a real romance/new adult binge as of late, so Cauchemar was a very different read for me. I stopped French after grade 10 (something I still regret!) so I had to look Cauchemar up, and according to dictionary.reverso.net, it means to have a nightmare- what a perfect title for this book! The whole book reads like a series of nightmares that Hannah cannot escape, as they continue to plague and haunt her and her loved ones. Grigorescu weaves a story that goes in-and-out of the past and present, at times the lines between these two are quite blurred that the reader may feel confused for a moment, but I think this just further helps the reader connect and relate to Hannah's state of mind, as she tries to piece together why her mother gave her up and why she chose to keep away from the public eye. Like the rest of the book, the ending will leave you with chills, as it leaves it open for the reader to interpret how he/she will. I would love to see a sequel, or maybe even a novella of a continuance to Hannah's story. Grigorescu's writing reminded me of critically acclaimed/awarded Canadian author, Lisa Moore, and I'm sure she will be celebrated in much the same light and her prose will be studied and picked apart in University Canadian literature courses haha. I would recommend this book to fans of literature, mystery with a dash of the paranormal and a generous helping of romance! 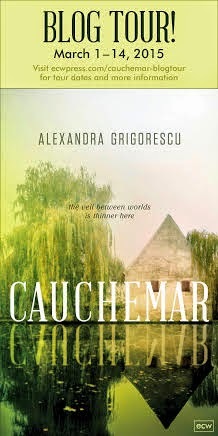 Alexandra Grigorescu is the author of Cauchemar (ECW Press, 2015). She has an MA in Creative Writing from the University of Toronto. 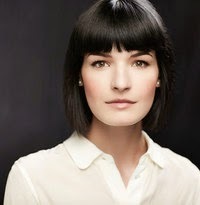 She's worked as a freelance writer/editor for various Toronto magazines and sites, including blogTO. Her writing has previously been published in Echolocation, Acta Victoriana, and the Hart House Review. She lives in Toronto, Ontario with her husband and a little black cat. It’s a refrain you hear often in writing classes and groups: write what you know. This means different things to different writers. For some, it means describing the nooks and crannies of their hometown as only they can. For others, it’s their emotional landscape, their personal experience, which gets sketched out on the page. Writing and publishing a book is a wonderful, weird experience. For many authors it begins in the small hours in some private corner of their minds, and is incubated and developed in isolation. Then, one day, it bursts forth, and they’re suddenly confronted with the idea of an audience. One question I’ve received several times is why, as a Canadian, I decided to write a book set in the South. A perfectly logical question, and yet it’s somehow not one I anticipated. On the surface, much of Cauchemar is forged out of imagination. I’m proud and grateful to say that I have a loving, supportive family. I live in a crowded, congested city of lights and skyscrapers. My personal journey through spirituality has been complicated, intellectual, and finally rewarding, but has never steered towards spiritualism, the orishas, or voodoo. I certainly haven’t lived a sheltered life on the edge of a Louisianan swamp. When I first started writing Cauchemar, I didn’t immediately locate it on a map. It was a swamp as a city-dweller imagines a swamp: wet, cloying, and almost prehistoric. Hannah’s house existed outside of time (pre-cellphones!). Writing what you don’t know can be a valuable experience in itself, and requires some serious flexing of mental muscles. I had to look at my own environment—which was at the time gray, noisy and full of exhaust—and visualize a place that was warm, humid, verdant, and isolated. As soon as Louisiana found its way onto the page, it became a bit more challenging. I researched the landscape, the seasons, the flora and fauna, and the food. I tried to get a sense of Louisianan folklore, as well as its rich cultural and religious influences. When we went down to Louisiana, I danced (clumsily) to the music, we ate the food, and I watched the water, wondering what lay underneath. I also sought out an albino alligator. Louisiana soon found its way into my writing process. Years ago, when I wrote poetry, finding the right words was a lot like stumbling in a dark cave, gauging the dimensions of one word against another. Eventually, I learned to listen to my intuition, and the words that felt right became those that fit right. Writing Cauchemar and trying to stay true to the setting was, in a way, a departure from that: a redbird on the shingles became a tanager; lemonade became sweet tea; the catch-all “spices” became cayenne, garlic, and paprika. My vocabulary expanded as I learned about the uses of copper, candles, and powdered snails. Learning about the swamp, the South, and its traditions added a layer of depth that fed my imagination. But some things don’t require research. Beneath the scares, the evocative landscape, and the larger-than-life scope of it all are some very basic, very familiar, and very human elements: love, the lingering effects of childhood, uncertainty, and the struggle of trying to find your place. A few of the book’s early scares were ones that I’d experienced myself. In one bachelor apartment in Toronto, I’d regularly come home at night to find my walls covered in silverfish that would immediately disperse as soon as I turned on the light. It left me rather paralyzed at first because WHERE DID THEY GO? The drastic changes that Hannah undergoes were also familiar to me. By the time I sat down to do the final read-through, it was interesting to see the ways in which both the book and I had changed. Since I’d written the first draft, I had experienced loss and grief, including the death of my beloved, nearly twenty-year-old cat, Smudge, who was Graydon through and through. I had married the man whose love inspired the beautiful moments of light in a nightmarish book. I had brushed up against faith, and it had surprised me. I returned to the manuscript wondering if I’d adequately described the scope and depth of emotions such as love, fear, and grief, and I realized that any of these could make you feel untethered and rather unhinged. Hannah might seem weak and rudderless at the book’s beginning; grief can do that to you, and it’s a long journey back to yourself. Fiction is, by definition, a product of imagination. As much as I tried to ground the story through researched descriptions and the hint of personal experience, I also tried to keep it in the realm of the fantastic. Even after extensive research, I still don’t know what it’s like to live on the edge of a Louisianan swamp. I hope—and hope readers agree—that my not knowing Louisiana intimately at the outset contributed to the book’s sense of magic realism. It’s an exotic landscape on the page because it’s an exotic landscape to me. I think so much of writing for me is a process of simultaneous layering and laying bare. That’s part of the pleasure of fiction: weaving together the known and the unknown into something that resonates with readers, but also transports them to somewhere they’ve never been. I sincerely hope that I succeeded in doing that with Cauchemar. your very own finished copy of Cauchemar! Be sure to check out the rest of the Cauchemar blog tour for exciting giveaways, interviews, excerpts, reviews and guest posts! Special thanks to ECW Press and Alexandra, for inviting me to participate in this tour! I'm very intrigued by the premise! It's a southern gothic drama and those are my favorite! Plus the book sounds amazing. Thanks for the chance!